Add some extra time to your campus arrival due to growth and construction on both sides of campus. Lot S47—south of the Life Science Building and Pickard Hall—will close permanently Wednesday, Oct. 26, for construction of the Science and Engineering Innovation and Research building. 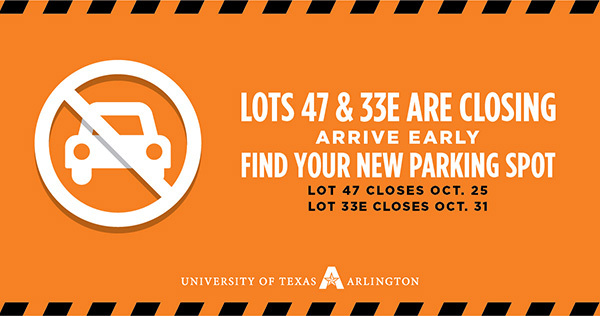 Most of Lot 33 East—north of the Maverick Activities Center—will close Monday, Oct. 31, for construction of a 1,500-space, five-story parking garage. See the parking maps for other options. Learn more parking options at the Pardon Our Progress and Parking & Transportation Services websites. LEARN MORE. The lower level of College Park South must be cleared by noon today, Tuesday, Oct. 25, for a private event. All vehicles parked on the lower level must relocate to another area of the garage or other permitted zones, or be towed at the owners' expense. The entire garage will be closed on Wednesday, Oct. 26, for a private event. Both College Park North and College Park Central will remain open during these events. For the latest parking news, go to uta.edu/progress. 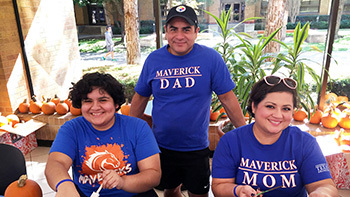 Maverick families made lasting memories at the 2016 Parent and Family Weekend. Three days of events brought families together for fun and excitement all weekend long. WATCH THE VIDEO. Cast your ballot for the fall campus elections 9 a.m.-6 p.m. Monday-Tuesday, Oct. 31-Nov. 1, in the University Center Gallery in the E.H. Hereford University Center. Fall elections are for Homecoming king and queen, UTA Ambassadors, and Student Congress senators. 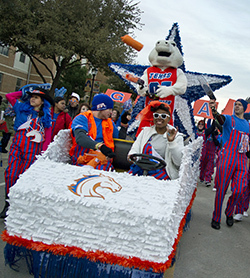 University departments and student organizations are encouraged to register an entry in the 2016 Homecoming Parade. Fees are $15 for walking entries or groups providing their own vehicle/float and $35 for entries renting a golf cart from the Homecoming Committee. Registration information is available at www.uta.edu/homecoming. The last candidate for director of the Center for African American Studies will give a presentation and meet with students, faculty, and staff. Jason Shelton, UTA associate professor of sociology and anthropology, will speak at 3 p.m. Thursday, Oct. 27, in the Student Congress Chambers in Room B150 of the E.H. Hereford University Center. The Veterans Assistance Center and TRIO Veterans Upward Bound are hosting a Trunk-or-Treat for student veterans and their families. The Halloween fun is 6-8 p.m. Friday, Oct. 28, at the Veterans Assistance Center. Donations of treats and volunteers are needed. For details, contact Kim Bennett at 2-9882 or kbennett@uta.edu. 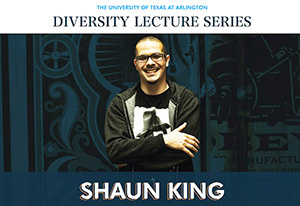 Hear Shaun King, senior justice writer for the New York Daily News, present "The New Civil Rights Movement” at 7 p.m. Friday, Nov. 4, at the Lone Star Auditorium in the Maverick Activities Center. The event is part of Multicultural Affairs' Diversity Lecture Series. Tickets are at utatickets.com. LEARN MORE. Through October—Midterm Progress Report grades are available in your MyMav Student Center. Check your UTA email to see if you get PR grades. Wednesday, Nov. 2—Last day to drop classes. Deadline 4 p.m. Undergraduate students who entered college for the first time in fall 2007 or later are limited to a total of six dropped courses during their undergraduate career. Discuss the impact of this when you meet with your adviser about dropping a course. Read about the six course drop limit policy and the list of academic advising offices. Check the impact of dropping if you receive financial aid at uta.edu/fao or email fao@uta.edu. Through Wednesday, Nov. 2—Grade exclusion and grade forgiveness requests can be made for eligible students for fall term processing. Contact your academic adviser for eligibility information. Wednesday, Nov. 9—Priority registration opens for winter intersession and the spring term. Advising is open; check your MyMav Student Center to see if you need to meet with your academic adviser before registering. The schedule of classes is being updated daily. See more on the UTA events calendar. TrailBlazer, UTA’s e-newsletter for students, is published by University Communications on Tuesdays during the fall and spring semesters and every other Tuesday during summer terms, except for holidays. Submit items for publication to trailblazer@uta.edu. Read the TrailBlazer Guidelines. TrailBlazer welcomes any non-students of UTA who would like to subscribe.